Welcome to the Personal Initiative Domain! Personal initiative identifies the individual ambition and motivation to succeed at something. No one can be forced to be an expert. Without exception, all experts achieved their expertise with at least some self-study. Expertise cannot be wholly taught or wholly learned but rather requires both experience and formal training. Personal initiative is the impetus that integrates both. It makes experience meaningful and knowledge practical. It stands to reason then, that competence will require individual effort and so this domain is focused on critical tasks such as making valid assessments and reporting them in a coherent manner. 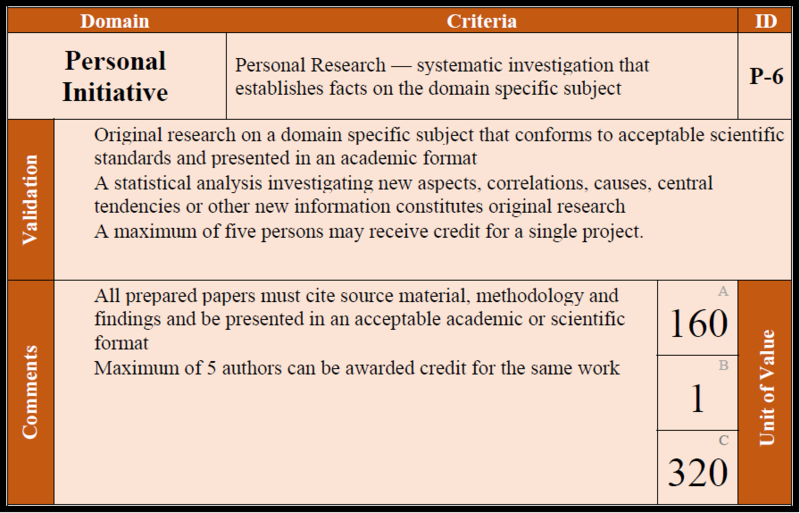 There are six criteria in the Personal Initiative Domain, one of which is mandatory. 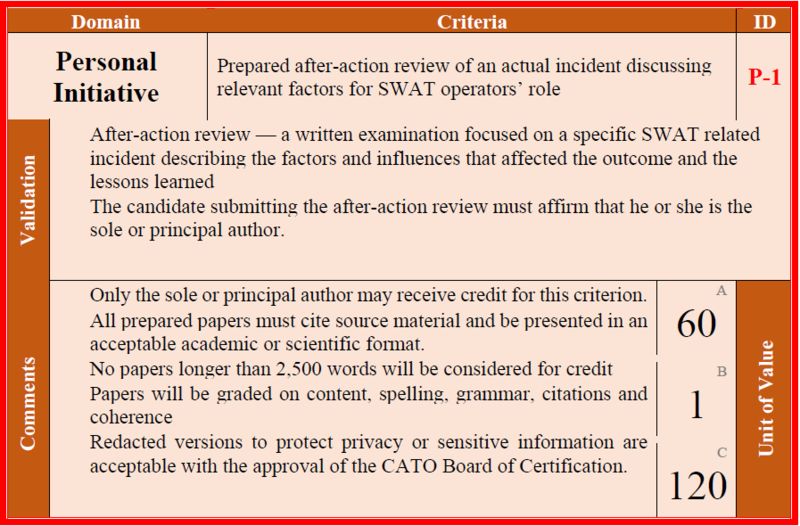 You must achieve at least 100 points in this domain, including the preparation and presentation of a written after-action review. 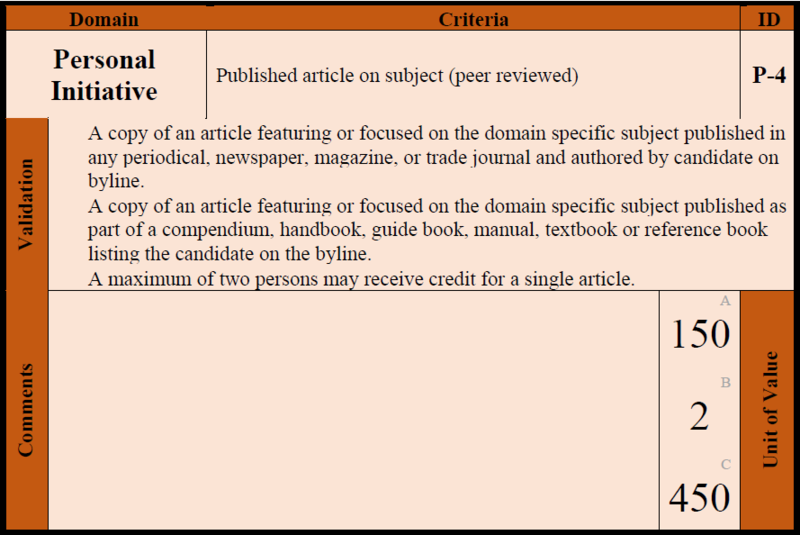 You may attain additional points by completing elective criteria, some of which may be repeated for additional points. Review the worksheets in the Personal Initiative Domain for a detailed explanation for how points are awarded, as well as information on grading, validation, repeatability and other information that will be used to assess the amount of points awarded. The worksheets may be examined online or downloaded for your convenience. When additional documents are added, a letter is appended to the domain criterion ID, proceeding alphabetically for each additional document. Example: [CA3697, P-5], [CA3697, P-5A], [CA3697, P-5B] 1st Document 2nd Document and so forth. All experts are required to demonstrate their expertise at one time or another. This is often in written form and this criterion recognizes the contribution of providing relevant facts to facilitate informed planning and decision-making. This criterion recognizes the contribution of this form of expression as a fundamental and necessary requirement. The candidate must be the sole author or principal author to meet this requirement. All experts are required to demonstrate their expertise at one time or another. This is often in written form and this criterion recognizes the contribution of providing relevant facts to facilitate informed planning and decision-making. This criterion recognizes the contribution of this form of expression as a fundamental and necessary requirement. The candidate must be the sole author to meet this requirement. Like teaching, writing has proven to be an excellent method for learning a subject because it requires some existing knowledge or research, and then distilling and organizing the material into an understandable format. 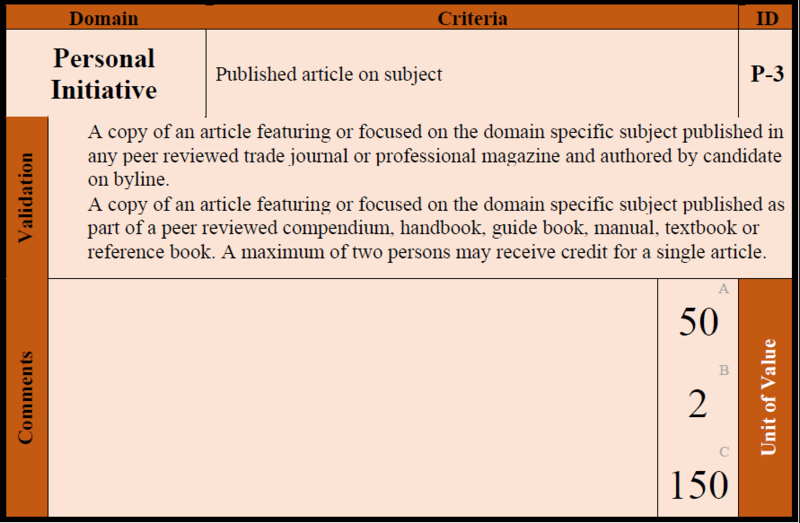 This criterion recognizes the contribution of gaining knowledge, skills and/or abilities by publishing an article on a specific subject, whether as the sole author, principal author or contributing author. The apex of professional writing is when a manuscript is accepted for publication by a peer reviewed journal. Peer review simply means that one or more subject matter experts have reviewed the manuscript for authenticity, accuracy, currency, readability and other factors. 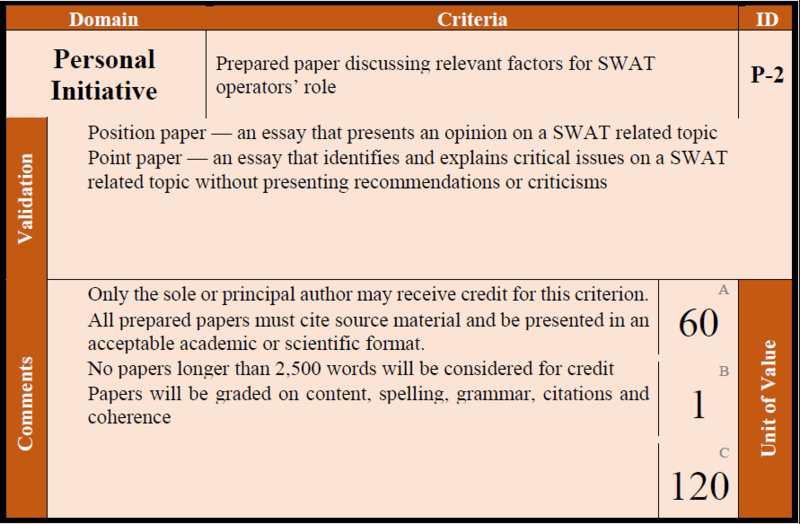 This criterion recognizes the contribution of gaining knowledge, skills and/or abilities by publishing an article on a specific subject, in a peer reviewed publication whether as the sole author, principal author or a contributing author. Research has long been recognized as a valuable method for gaining knowledge, skills and abilities. It not only enhances the expertise of the researcher but contributes to the field by expanding the insight and understanding of others. Accordingly, this criterion recognizes the contribution of research in mastering a particular subject by identifying, organizing and summarizing existing research on the specific role. Candidates seeking to be recognized through this criterion must gain approval of the vetting committee for subject and format. 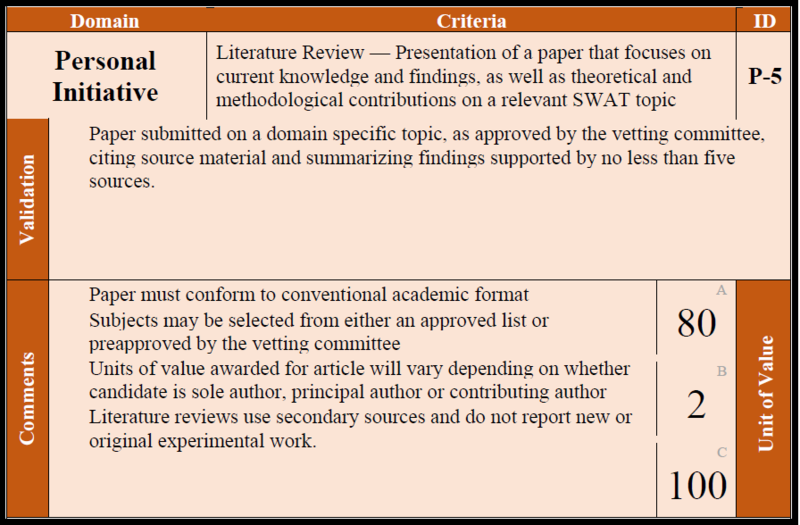 Notwithstanding, the literature review may be in conjunction with an unrelated academic requirement, other formal training, or personal research. With nearly no exceptions, all expertise begins with and is based upon the experiences, research, writings, opinions and insight of others. These in turn provide new insights and understanding which, in themselves, benefit from investigation. In many cases, some factor became recognized only when it became relevant and so an informed decision was impossible without further research. This criterion recognizes the benefits of conducting original research to determine or verify particular aspects relating to a subject. Likewise, statistical analyses provide a scientific basis for understanding trends, potentials, tendencies, correlations and anomalies related to a specific subject. The candidate may be the sole researcher, principal researcher or contributing researcher to meet this requirement.